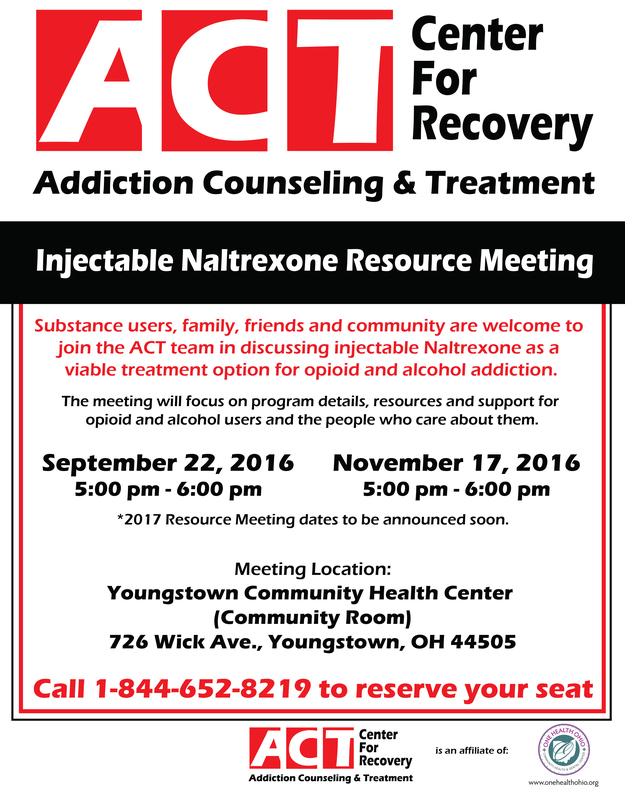 ACT Center For Recovery, a ONE Health Ohio affiliate, will host a substance abuse addiction resource meeting at the Youngstown Community Health Center (Community Room) located at 726 Wick Ave., Youngstown OH 44505 on Thursday, September 22, 2016. The meeting will be from 5:00 pm to 6:00 pm and is open to the public. Future resource meeting dates include Thursday, November 17, 2016 from 5:00 pm to 6:00 pm at the same location. Substance users, family, friends and the community are welcome to join the ACT team in discussing injectable Naltrexone as a viable treatment option for opioid and alcohol addiction. The meeting will focus on program details, resources and support for opioid and alcohol users and the people who care about them. Call 1-844-652-8219 to reserve your seat. Due to the overwhelming epidemic of opioid and alcohol addiction in the tri-county, ONE Health Ohio’s Medication-Assisted Treatment Program has grown exponentially in the last 6 months. This response has impelled ONE Health Ohio to branch off and establish ACT Center for Recovery, which will soon have new locations popping up across the Valley.